From the moment that Guy Ritchie’s fast-paced, dialogue heavy and twist-filled debut movie starts, you are very aware that you are watching something special. It starts quite nonchalantly, very low-key, as Nick Moran’s Eddy, clearly battered and beaten, explains some of the finer points of poker. It is an example of Ritchie’s skills as a writer, as Eddie explains the rules of a game that will be integral to the first act and the whole plot as a whole: the audience just doesn’t realise that yet. It is his skills as a director which are put on show next as we get the introduction of Jason Statham’s Bacon, talking a miles a minute trying to sell some “dodgy gear” and then ends the scene with a very matter-of-fact narration by Alan Ford and the great use of song Hundred Mile Hour by Ocean Colour Scene. This scene is only a couple of minutes long but in it lies the secret to Ritchie and Lock, Stock’s success… it doesn’t pander, it just presents the details and lets the audience fill in the rest. Those details make up a story full of intricate parts, a cast full of bizarre, almost entirely memorable characters and a plot which intertwines, inter-links and expertly wraps itself up in a bow, with a great final climax twist too. It is to Ritchie’s credit that you won’t see where the story is going, how each character interacts or what unseen links are made before they are revealed and when they are, you can’t help but smile at his success. That won’t be the only reason you’re smiling either. Ritchie has written a very fumy script which doesn’t relent on the London/Cockney accent and dialogue, while creating a quotable phrase every other line. Rhyming slang, bizarre turns of phrase and every accent from East-End gangster to Scouse Liverpudlian are included but it is never less than clear and just adds to the inherent humour within the script. This is also helped by the excellent cast. It is a who’s who of “before they were famous” with Statham leading the charge in one of his earliest roles but now director Dexter Fletcher, Hollywood supporting actor Jason Flemying and B-Movie action star Vinnie Jones making up the rest. Even turns from singer Sting and ex-convict Lenny McClean make perfect casting sense. Ritchie doesn’t put a foot wrong the whole movie. This even stretches as far as the soundtrack to the movie. Not since Quentin Tarantino has a movie been so perfectly scored, with the music seeming to capture or direct the mood of the scene each time. Music by Robbie Williams is played in the same movie as songs by James Brown but nothing is out of place and it can’t help but add to the fast-paced tone of the story. 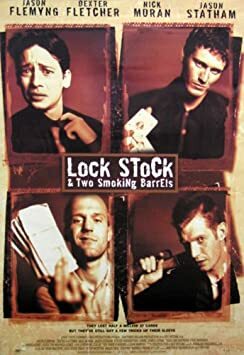 Overall, Lock, Stock and Two Smoking Barrels is a showcase of Guy Ritchie’s talents in his first feature film. It is sharply written, complicated without being confusing and intricately plotted but never so much so that you are “left behind.” The soundtrack works to accompany the very funny script and placed in the hands of the well-constructed cast, this was always going to be a success. Very entertaining review, makes me remember how much I love this movie. It is a great. I’d forgotten how much I enjoy it too. Your outstanding review has me wanting to watch it again. Aw man – not seen this in AGES but it still gets endlessly quoted among friends. Need to re-watch pronto!